Heat olive oil in a large saucepan over medium heat. Cook onion, sweet pepper and garlic in hot oil about 5 minutes or until tender. Stir in undrained stewed tomatoes, chicken broth, ham and Cajun seasoning. Bring to boiling; reduce heat. Simmer, uncovered, for 5 minutes. Stir in rice. Remove from heat. Cover and let stand about 5 minutes or until rice is tender. 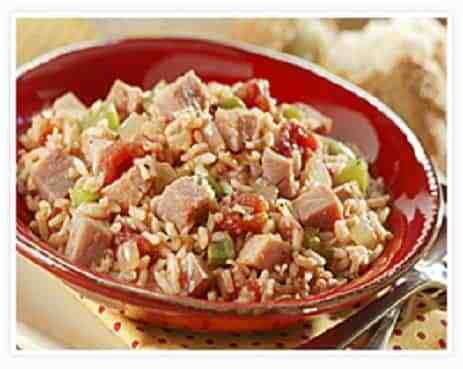 Ham leftovers with a Cajun feel. Serve with a green salad and a tall ice tea. Recipe and photo courtesy of The National Pork Board-Used with permission. Join our Facebook Recipe Group. We aren't all Cajun, we just like to eat! We provide Cajun recipes, and other recipes from around the world. We aren't all Cajun anymore.